Time,Time..I have all the time --: The Black Forest/ Schwarzwald: The Fairy Tale Country!! The Black Forest/ Schwarzwald: The Fairy Tale Country!! We set out on our tour of Central Europe starting from Frankfurt. Since our tour doesn't include the Black Forest, we decided to arrive a few days before the trip and tour this region by ourselves. However, our very close friend offered to drive us to Black Forest, and we accepted his offer. Despite the rain, we did manage to have good fun there. This is German fairy tale country, full of creepy legends and such figures as Hansel and Gretel and Snow White. Remember to bring along some breadcrumbs to make a trail home, and watch out for mean, wicked, witches!!!! Black Forest remains wildly beautiful, with little chapels and wooden farmhouses,and is no longer wild nor isolated, and is popular place for hiking and mountain biking, or just chilling. The Black Forest is a rather happy place, known for its cherry schnapps, cream-filled cherry cake and cuckoo clocks. The first cuckoo clock was designed here in 1750, and soon farmers all over the Black Forest were spending their snowbound winters carving clocks for additional income. The clocks haven’t changed much since, and are still characterised by gabled roofs, cast-iron pine cone weights and carved adornments. Elaborate versions have music-box figurines that come out to dance or chop wood. However, they are all very expensive, but really worth it for they are all hand made. Surprisingly I was told most Germans do not have a Cuckoo Bird Clock, for I believe it is mainly made for the tourists. Anyway, since I am a die hard tourist, and I do love Cuckoo bird clocks, I bought one from here. Nothing fancy, but a beautiful traditional one. Triberg is located directly on the Black Forest railway line and is famous as Germany's highest waterfalls, which have an overall drop of 163 metres over 7 cascades. There are three entrances to the waterfalls, which are reached via asphalted paths, steps and footbridges. You should be a reasonably good walker of course, and the paths are totally unsuitable during the rains, and unfortunately it rained during our trip. However, you can reach the lowest and largest cascade of the waterfall relatively easily from the main entrance. Later we visited Mummelsee, expecting the weather to improve, but no luck, we could just have the famous Black Forest Cake and see only clouds and no lake from the terrace (right behind me) of the Berghotel there. If the weather had been good we could have feasted on some wonderful views of both the lake on the banks of which this hotel is situated, and also the great, dark forest ranges there. There are many activities like boating, para sailing etc., that could have been done if the weather was good. All we could do was to dig into the absolutely delicious and sinfully rich Black Forest Cake, for which this hotel is famous for. The lake is right there behind us, but hidden by heavy clouds. Well this is Germany, where the weather is very unpredictable, it keeps changing and fooling people there all the time. The weather was checked, and it was said to be sunny and pleasant, but still turned out to be a very rainy day. The next two days were absolutely pleasant and sunny, just our bad luck!!! Lake Mummelsee is located directly on the Black Forest High Road at 1032 m above sea level. It is one of the few cirque lakes in the Black Forest remaining from the ice age: a magical lake ruled by an underwater king and water nymphs/mermaids, according to the legends. At 1032 meters above sea level it is the highest cirque lake in the Black Forest, meaning that it lies in the center of a cone amphitheater created 10,000 years ago during the Ice Age. There are so many stories regarding this place, some claiming that the nymphs and king rise from 17 meters below the surface each night, while others say it only happens on a full moon. It is also said that, fascinated by many of these stories, the famous Brothers Grimm visited the lake in 1845, collecting retold stories from the forest and to see the lake for themselves. Never the less, we did enjoy our drive to the Black Forest with our dear friends. Our friends told us that to do full justice to BF one has to stay here at least for 4/5 days and see all the beautiful places in and around BF. Never mind next time may be. Called Schwarzwälderkirschtorte in German, which means Black Forest Cherry Torte or Gateau. This cake has multiple (usually 4) layers of chocolate sponge cake, cherries, and whipped cream. It is frosted with whipped cream and covered with chocolate shavings and a few cherries for decoration. Kirschwasser (cherry schnapps) is used to flavor the whipped cream. The bottom layers of sponge cake are also brushed with Kirschwasser (cherry schnaps) to provide moisture and a little extra flavor. There are many other ideas on how the cake originally got its name. Some historians say that it is possible that the cake got its name from the traditional costume worn by women in the Black Forest. 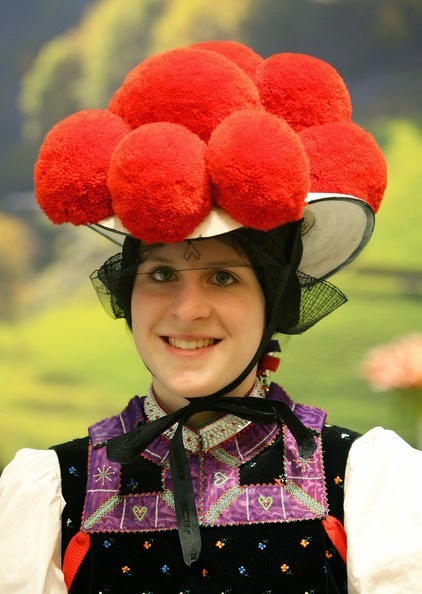 The dress was black (just like the chocolate flakes), the blouse is white (like the cream), and the hat has red pom-poms that look just like cherries. Makes sense, what do you think? I was so so much looking forward to this post Rama, lovely pics and narration! Glad that you had a great time. Thank you Padmaja, you are very encouraging. Yes we did have good time throughout our trip with no rains to spoil our trip anywhere. Beautiful photos. What an awesome experience. Thanks Adrianne. One has to make the most of the situation, enjoy the Black Forest in the rain too! I really appreciate your comment. Have a great weekend! So beautiful Rama....I wish I could go there one day...now, I know where the Black Forest name comes for the cake. I never thought I would ever be visiting BF. I had read so much about it, the origin of its name etc. However, I was to see it in person, and I thank my stars for making it happen in this lifetime. You would definitely enjoy, and must make a point to spend at least 4/5 days there for there are many beautiful places to see in and around BF. The whole of Central Europe is also very beautiful. Beautiful pics and nice narration of the place. Black forest is on my wishlist. Although today there are many duplicates of the cuckoo clocks, nothing to beat the feel and vibes of the original mechanical onel. My grand pa had brought this during his visit in 1970. Thanks Asha. You must visit it when you are in Germany. Hope you can make it soon. Thanks for the wonderful description and beautiful photos. Beautiful pictures and the same for narration..loved it. Thanks Renu, I am glad you liked it. Actually for a few minutes I was in Black Forest.The words and pictures are wordlessly profound.Thank you for taking us on a tour. It was my pleasure. Thanks. I always love reading travel blogs with pictures, and it is true sometimes, they almost makes us feel as if we are there with them. I am surprised a well travelled man like you have not been there. Maybe soon you will visit these places, and in good weather too. Thanks Rahul. Very interesting narration, Rama! I have never heard of this place, until now! Cuckoo clock history is interesting! I had one but the birds stopped chirping long ago! You should get it repaired by an authorised dealer, if it is indeed from Black Forest, for there is their service center here in Bangalore (the only one for the whole of India). Loved your fairy tale narration Rama, glad you had a lovely time without any witch trouble :P Nice to know the story behind the black forest cake. Thanks Reshma. It is the story and the clock and the lovely nature that draws people to this region. Thanks Ankita. It is indeed a fairy land, and the people maintain it that way. It's so beautiful to look at the countryside and if anyone offered me a chance to stay in one, I would gladly accept it. We are all like that only. When I went to Sikkim, I liked the mountains and the snow there so much, it was so peaceful, but when i asked the locals about how they felt living in such beautiful surroundings, they said they were bored seeing this everyday of their life, and they wanted to live in the noisy, crowded cities. You look so nice in all those photos, rama! Black Forest is a beautiful region. It is the place where the Danube springs, the great river at one border of my country. Thank you so much for the compliment. Yes it is where the lovely Danube springs and you are lucky. I am really touched, you have visited so many of my recent blogs.